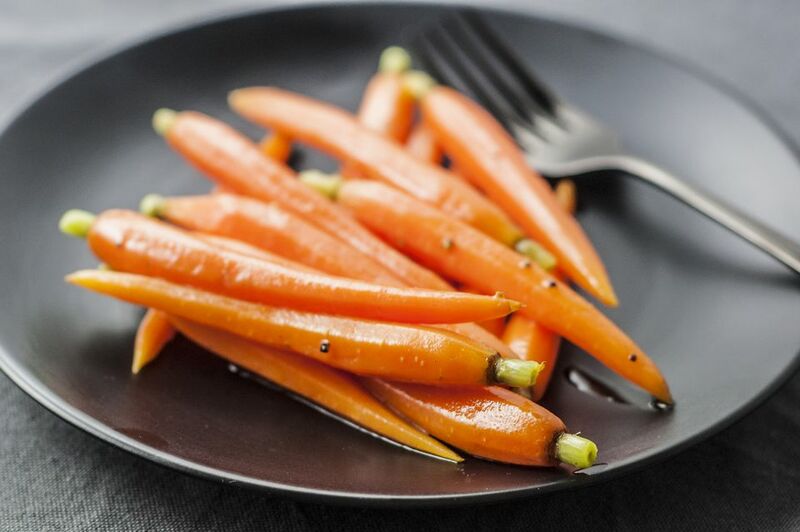 This tasty recipe for buttered baby carrots couldn't be easier! It's the perfect side dish for any grilled steak or chicken or is a delicious and easy addition to a holiday dinner. Did you know that baby carrots are not really 'baby' carrots, but instead are full-sized carrots that have been trimmed down to a smaller size? Even though they don't look like they do when they come out of the ground, the carrots are still a special variety that has a very small inner core. That core tends to be less sweet, so baby carrots are sweeter than regular carrots. And they are super easy to prepare because you don't have to peel them. Do look over the carrots first, though, and remove any that are split. Trim any carrots that may have some green attached. Serve these carrots with everything from roast chicken to meatloaf or grilled steaks or hamburgers. Everyone loves them, including small children. Place the carrots in a saucepan and add water to cover by 1/2 inch. Lower the heat to medium and simmer the carrots for 3 to 6 minutes or until tender when pierced with a fork. Remove the saucepan from the heat, drain the carrots, and turn the heat off. Return the carrots to the saucepan and add the butter. Place the saucepan with the carrots and butter on the burner with the heat off. Let butter melt; stir gently to coat ​carrots. Sprinkle with salt and pepper and serve immediately. Use baby carrots, as they are already trimmed and the perfect size for this recipe. Plus, they are a bit sweeter than regular-sized carrots. Don't be afraid of the fat in this recipe. The use of the butter provides the flavor for these carrots. We don't recommend using margarine or olive oil, as it won't result in the same flavorful side. Plus, eating some fat with foods, such as carrots, that are high in fat-soluble vitamins lets your body absorb more of those vitamins. This recipe is easily doubled or tripled if you are going to be serving more than four people. Varying this recipe is easy. You could add some chili powder and cumin to make this a Tex-Mex recipe, or add dried herbs such as thyme, oregano, or basil. Or, add some chopped green onion or some flat leaf parsley for a garnish. You could make this recipe with sliced whole carrots too; just increase the cooking time to 4 to 7 minutes. Taste the carrots; when they are tender but still slightly firm they are done.